Represents the GUI Testing tab of the Options dialog box and other tools that enable you to configure options that apply to all GUI tests and business components. You can click the Generate Script button in the GUI Testing tab > General pane of the Options dialog box to automatically generate an automation script containing the current global testing options. The options in the GUI Testing tab are divided between the various panes in the tab. This object also includes a property that returns the Object Identification dialog box. 'This example opens UFT and configures the Terminal Emulator options. qtTeOptions.PropertyPatternsFile = "C:\Program Files\Micro Focus\Unified Functional Testing\Dat\PropertyPatternConfigTE.xml"
qtTeOptions.BlankLines = 0 ' No blank lines at the bottom of the emulator window. qtTeOptions.ScreenLabelUseAllChars = True ' Use protected and unprotected fields to identify the screen label. qtTeOptions.WindowTitlePrefix = "MyTerminal" ' Identify the terminal window based on its window title prefix. qtTeOptions.TrailingFieldLength = 5 ' if the field begins with more than five black characters. qtTeOptions.BeepOnSync = False ' Do not beep after each Sync step. qtTeOptions.UseKeyEvent "@R", "17;52" ' Replay the TE_RESET key using the CTRL+R keyboard event. RestoreLayout Restores the window's size and layout. The languages to use for text recognition when using the Abbyy OCR engine. UFT versions 14.50 and lower: This property is named AbbyOcrLanguages instead. ActiveScreen Returns the ActiveScreenOptions object, which enables you to set your Active Screen preferences. AutoGenerateWith Indicates whether 'With' statements are automatically generated after recording. AutoParameterizeSteps Indicates whether test steps are automatically parameterized when you finish a recording session. AutoParameterType The type of parameter to be used for all automatically parameterized steps. DisableVORecognition Indicates whether recognition of virtual objects is disabled. DisplayKeywordView Indicates whether the Keyword View will be displayed when a test or scripted component opens. Java Returns the JavaOptions object, which enables you to set Java-specific options for all tests. MCConnection Returns the MobileConnectionOptions object, which enables you to configure a connection to Mobile Center. ObjectIdentification Returns the ObjectIdentification object, which enables you to manage test object class descriptions. Run Returns the RunOptions object, which enables you to set run options for all tests and business components. 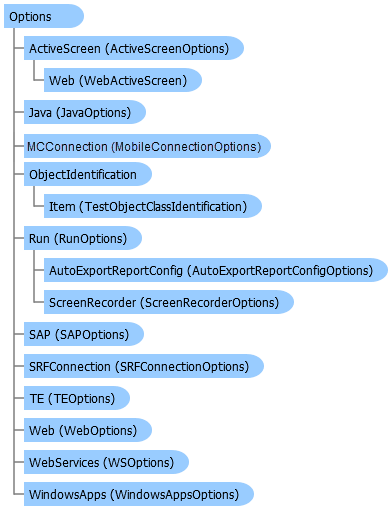 SAP Returns the SAPOptions object, which enables you to configure how UFT tests SAP applications. SaveLoadAndMonitorData Indicates whether to save integration data with tests and business components. SRFConnection Returns the SRFConnectionOptions object, which enables you to set SRFConnection-specific options for all tests. TE Returns the TEOptions object, which enables you to configure how UFT records and runs steps on terminal emulator applications. TesseractOcrConfigFile The path to the Tesseract config file. TesseractOcrConfigMode Enables you to specify that UFT uses the default Tesseract configuration or load configuration from a config file. TesseractOcrLanguageData The language pack to use for text recognition when using the Tesseract OCR engine. TesseractOcrTesseractOnlyMode Enables you to specify the mode for text recognition. TesseractOcrWhitelist The symbols to use for text recognition when using the Tesseract OCR engine. TesseractTessdata The path to get the test data. TextRecognitionBlockType Indicates whether the text block recognition mode is set to single text block or multiple text block. TextRecognitionImagePreprocessing Indicates whether image preprocessing is enabled when performing text recognition. TextRecognitionOcrMechanism The OCR mechanism to use. TimeToActivateWinAfterPoint The number of tenths of a second after which to activate a window when pointing to it. Web Returns the WebOptions object, which enables you to configure how UFT records and runs steps on Web applications. WebServices Returns the WSOptions object, which enables you to configure how UFT tests Web services applications. WindowsApps Returns the WindowsAppsOptions object, which enables you to configure how UFT records and runs steps on Windows-based applications. WithGenerationLevel The minimum number of identical, consecutive objects for which a 'With' statement will be generated.